Calabar were winning their fourth successive title, while Edwin Allen lifted their second in a row and third in the last four seasons. On the boys’ side, C’Bar did everything they needed to do to secure the victory with 280.50 points, as Kingston College scoring 265 points for second and Jamaica College taking third with 200 pts. The top ten was completed by St. Jago High (183) and St. Elizabeth Technical (132) in fourth and fifth, Wolmer’s High (68) in sixth, Petersfield High (50), Holmwood Technical (44), Cornwall College (38) and Edwin Allen High (34). The girls’ side saw Edwin Allen High running away with the crown after scoring 321 points to beat Hydel High, who were 100 points behind in second place with 221. St. Jago scored 219.33 to finish third ahead of Holmwood Technical – fourth 206 and Vere Technical High, who completed the top five with 136 pts. Wolmer’s (82.50), Manchester High (61), Convent of Mercy Alpha (60), St. Elizabeth Technical (51) and St. Catherine High (44) rounded out the top ten finishers. 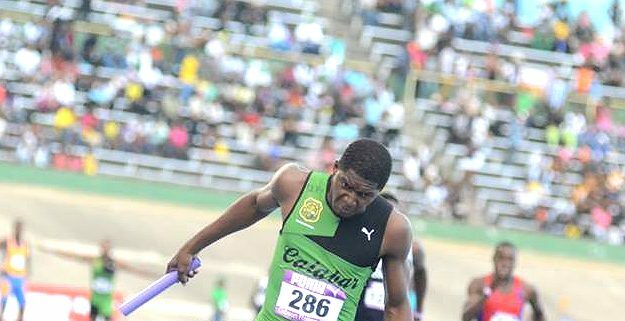 A total of 14 records were shattered during the five-day championships, which saw Calabar taking down two in the relays on Saturday’s final day. Overall, there were eight records broken among the boys, with the girls accounting for six. The highlighted moments on day five were the record-breaking runs of Akeem Bloomfield, who became the first 44 seconds runner at Champs when winning the Class One 400m in 44.93secs, as well Calabar’s 39.08 performance in the Class One boys’ 4x100m and their 3:06.76 outing to win the 4x400m. Star sprinter and captain of the Calabar squad Michael O’Hara, finished the championships with four gold medal, including the 110m hurdles crown after getting the better of Jaheel Hyde once again. Christopher Taylor, who returned top of his class in the 200m and 400m before running the anchor leg on the 4x400m team, claimed three gold medals. Lisa Buchanan of Holmwood was also outstanding in the girls’ category where she won three titles — the 800m, 1500m and the 3000m, with St. Jago sprint stars Kimone Shaw and Natalliyah White also finishing with three gold medals at these championships after winning their respective sprint doubles and 4x100m relays. Edwin Allen’s Class Four girls were also very impressive at Champs, after they lowered the 4x100m record twice and ended with 46.65 seconds. The previous mark was 47.28.